Colour: A dark cherry colour with good depth. Aroma: Balsamic aromas with hints of ripe fruit, complex and spicy. Taste: The attack is fresh and light, with soft, rounded tannins. The finish proves persistent with some reminders of toasted oak. Its passage through the mouth is pleasant and elegant, fresh and easy to drink. This wine goes well with ham, not very mature cheeses, casseroles with sauces which are not too spicy, boiled or stewed pulses, poultry, red meat, grills and roasts. After 150 years of great experience, his success and key to success has been to combine as one its long tradition and established brand with regeneration and adaptation to the times of all its facilities and, most importantly, modernizing its range of wines . A house that, somehow, has always been ahead of its time, a house that has been known to take risks and successful approach without losing its cultural background. Proof of this are for instance your bet and incursion "early" in Rueda, his Baron de Chirel, his new winery, its renewed wine reserve and his new estate wines. Founded in 1858 by Camilo Hurtado de Amézaga, Marqués de Riscal, stands as one of the most recognized and historical brands in the Rioja and Spanish wine world, now almost more for the brave, bold and modern extension of the hotel cellar, to by Frank Gehry that undoubtedly represents a very sound bet Guggenheim style with international management and wine therapy spa. Against its price this is a full bodied very nice tasting Rioja Reserva. We drank it a few times now with 4 people, and we all agreed on that! One warning though, don't let the wine air before drinking, or leave it open for too long, because we noticed that after 1,5 hour of opening, the wine started to oxidate and lost its tasty appeal...! Jamais de mauvaise surprise avec ce vin, quelles que soient les années. Bien équilibré, un bon Rioja, qui se boit bien sur toute viande blanche ou rouge. Marqués de Riscal Reserva, red wine D.O.Ca. 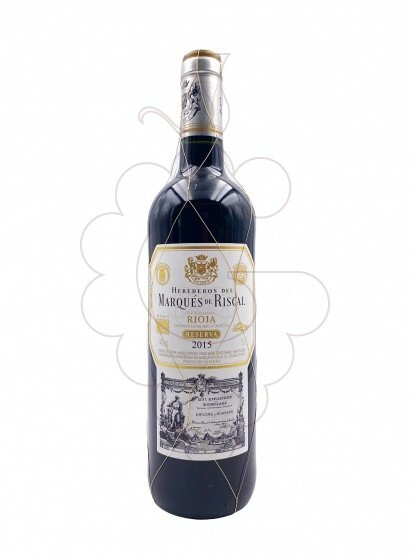 Rioja, one of the more than 9000 products you can find in our online shop.